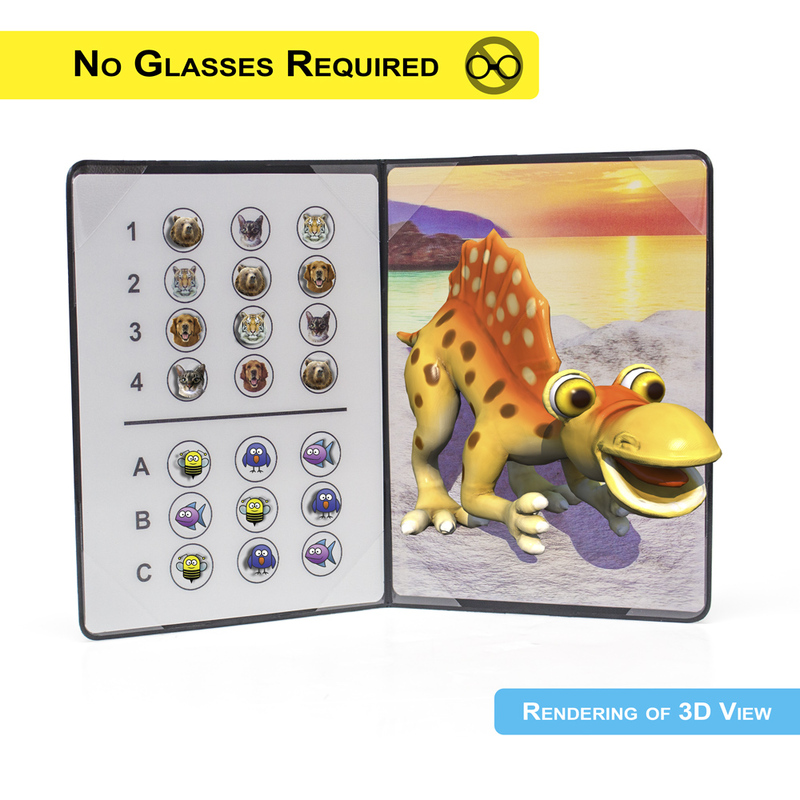 The new glasses-free depth perception test utilizes lenticular technology in order to create a colorful and less expensive depth perception test without the need for red/green or polarized glasses. This technology also allows for color images to improve interest and images that will resist fading over time. It also has several challenges; the key one being apparent motion. 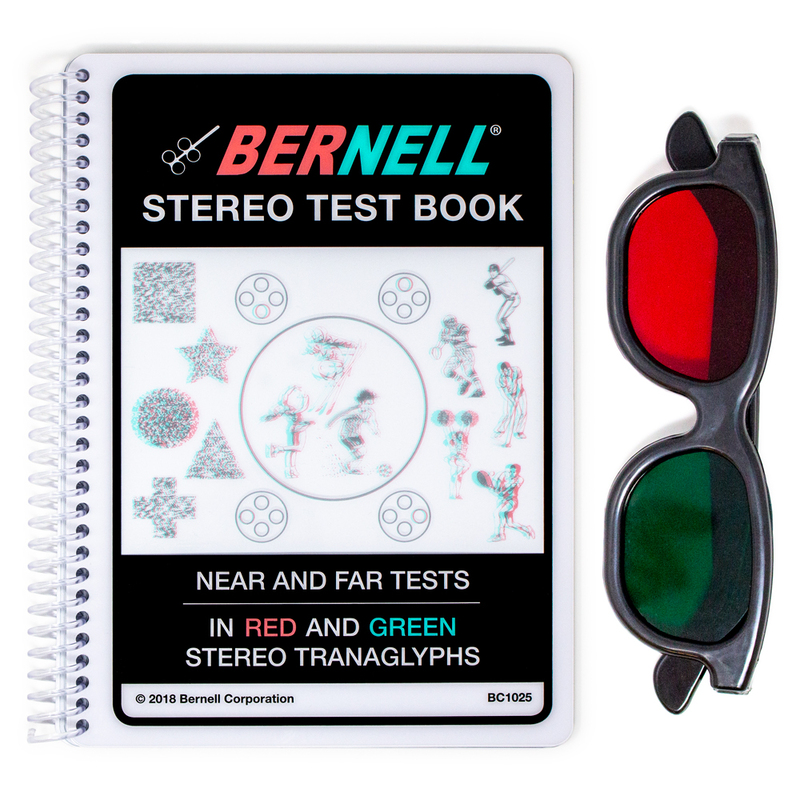 If the test were set up like the traditional polarized version, the answer could have been obtained by even a monocular patient by moving the test from side to side to see which image moves; similar to the apparent motion seen in the polarized type tests by closing one eye at a time. In order to prevent such a hint, this test was designed differently. One image in each row appears to be closer and one appears farther compared to the circle in which they are housed. If the test is moved or twisted from side to side (which they are instructed not to do) one can tell which ones are different, but not whether they come out or go in. Plate #2 features clip-art characters that are divided into two separate tests. Test 1(Rows 1 - 4) tests fine depth perception with range of targets progressing from 400 seconds of arc down to 40 seconds of arc. Test 2 (Rows A - C) test a row at 400 (Row A), 200 (Row B), and 80 (Row C) seconds of arc targets. • Test is housed in a black leather, diploma style booklet. • The answer key is printed on the back of the booklet. 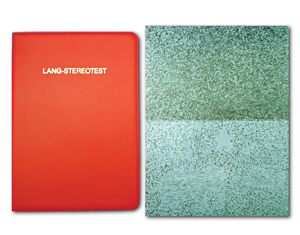 Booklet Dimensions: 6" x 8"